As we approach a new packing season, now is a good time to consider your handling and cooling operations. Take the time to walk through your facilities with pad and paper in hand. This will jog your memory about issues you noticed last season so that they can be fixed this season. You also may notice something new that must be addressed. Dumping produce onto a packing line and running the produce over the line introduces many opportunities for mechanical injuries to occur. Often those injuries take time to develop, so they may not be caught and removed by your graders. Tomatoes, for example, can suffer internal bruising that is not apparent until the fruit is cut. 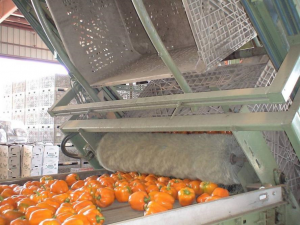 Excessively harsh impacts are the most common problems we see on fruit and vegetable packing lines. These can be the result of drops that are too high when produce is transferred from one piece of equipment on the line to another. The way to minimize this problem is to install plastic curtains or counterrotating brush rolls with extra-long, soft bristles to slow down the transfer (Figure 1). Even a small drop can cause injury when the drop is onto a hard surface. Transfers onto metal roller conveyor beds can be especially damaging. Slowing the transfer with curtains or brushes helps. 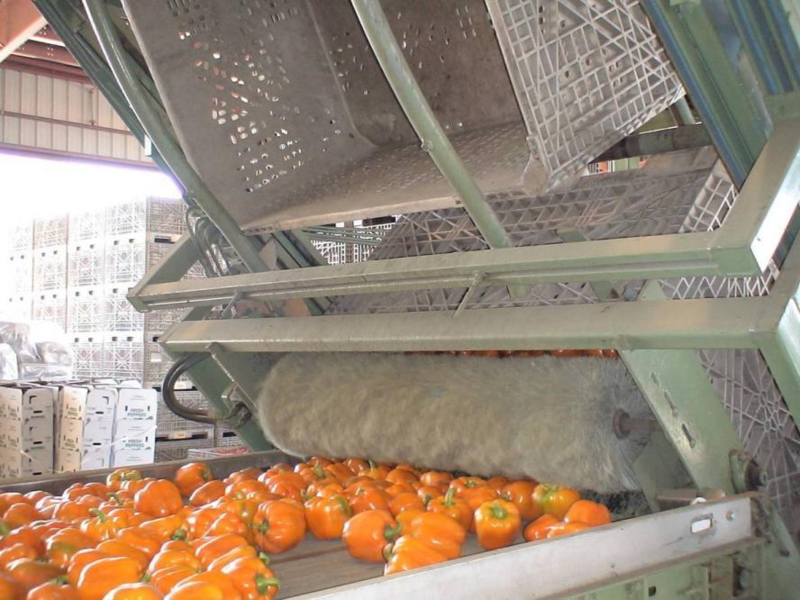 When produce passing over a sizer drops onto a takeaway belt, the belt should be freely suspended, not running over a metal plate. You can cut out the center of such plates to reduce injury. 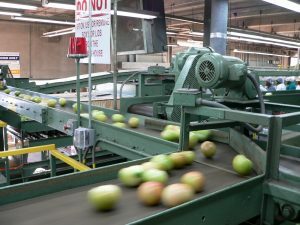 Another common source of packing line injury is changes in direction that result in the fruits and vegetables slamming into a wall in order to make a turn. Turns should be avoided when designing a packing line, but if you’re stuck with them, the way to make the best of the situation is to install padding on the offending surface. If your packing line already has such padding, now would be a good time to check its condition and replace it with fresh material if needed (Figure 2). Line coverage is another factor that can affect packing line injury. Full coverage of the conveyors with product so that all of the items are moving along together reduces injuries, because individual items have little chance to accelerate and be “launched” from one piece of equipment to another (Figure 3). The easiest way to control line coverage is by adjusting the dump rate at the start of the line. It’s also possible to install variable speed motors on individual pieces of equipment so the line speed can be regulated. The packing line manager needs to be in tune with his packing line workers and adjust the dump rate and line speed to match the amount of sorting and grading required for each lot of produce. That is, lots with higher packout can be moved over the line more rapidly than lots with lower packout. 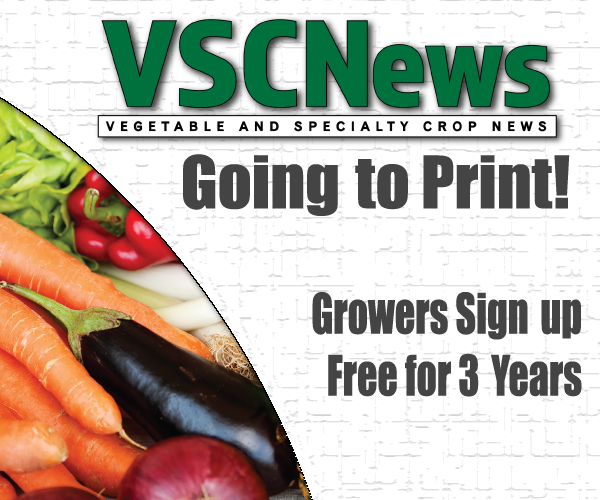 Effective cooling is critical to maximizing produce shelf life. However, if not properly maintained, cooling efficiency will decrease, requiring longer cooling times. For forced-air systems, inspect the fan units, replace any drive belts as necessary and check the padded seal around the return air screen for integrity. For hydrocooling systems, thoroughly clean and sanitize the return tank and drip pan area, fill and run the pump to inspect for uniform water coverage and service the drive chains and conveyors as necessary. Vacuum coolers should also be thoroughly cleaned and sanitized. Service the vacuum pump and refrigeration system as necessary. Cleanliness is also important. 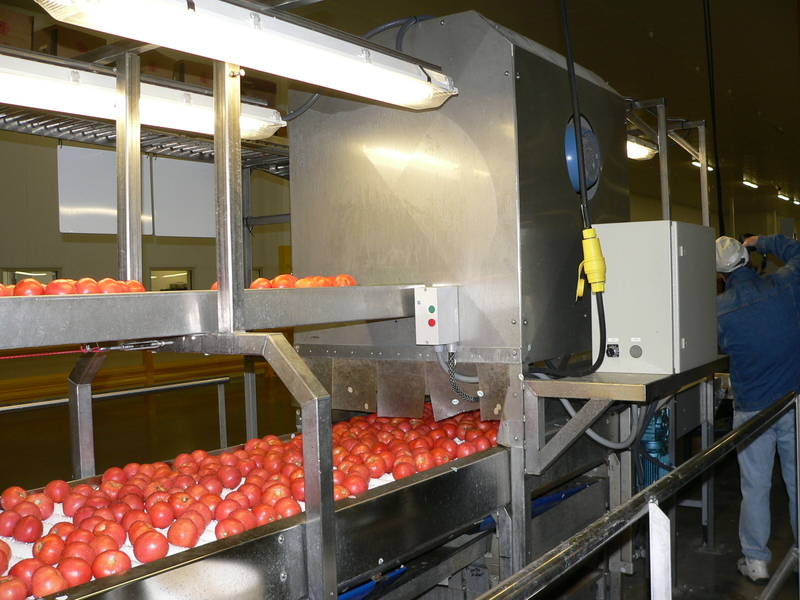 Any surface that may come in contact with produce needs to be included in a regular cleaning schedule in your standard operating procedures (SOPs) to keep it from becoming a source of contamination that leads to food safety issues. On a packing line, that includes dump tanks and dry dump surfaces, conveyor belts, roller conveyors, brushes, sponges and sizers. It is very important to remove all debris that may have been left from the previous season as well as accumulations from the off-season. Something that doesn’t directly contact your produce, but is still a potential concern for food safety is the refrigeration units in cold storage and forced-air cooling facilities. Refrigeration coils tend to collect whatever floats around in the air, and they provide a moist environment that can favor survival of microorganisms. Remove debris and clean the coils and surfaces with an approved sanitizer at the beginning of the season. Your SOPs should also include regular cleaning and sanitation of the cooling units, refrigeration coils and adjoining cold rooms during the packing season. An important point for hydrocoolers is that the water must be constantly sanitized during cooling, and it must be routinely changed because suspended solids accumulate during cooling, reducing the efficacy of the sanitizer. Now is a good time to get your tune-up started! Jeffrey K. Brecht and Steven A. Sargent are professors in the Horticultural Sciences Department of the University of Florida Institute of Food and Agricultural Sciences in Gainesville.